End Caps are proven to increase sales! 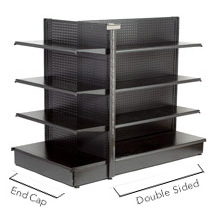 30% of all store sales come from end-of-aisle displays, also known as End Caps. Our Superior Gondola End Caps are easy to assemble. Gondolas are constructed with a heavy gauge steel with a steel pegboard back which is a SSS exclusive. Superior Gondolas feature high tensile steel uprights for convenient shelf placement. Built-in levelers and snap-together parts make installation simple. These gondolas can hold an exceptional load capacity. Gondola End Caps are used at the end of an aisle. End Cap units cannot be used alone. All End Caps have open backing design. Optional back cover panels are recommended to use with double-sided gondola, item# are available for purchase separately.